So following the three weeks of "who was it that tried to steal the cookie from the cookie jar" showdown in Turkey, it turns out that the first head of state that Turkey's president Recep Tayyip Erdoğan will be meeting post-coup is occurring today in St. Petersburg, and with none other than his newest BFF-FAW (Best Friend Forever For A While), Vladimir Putin. This might come as a bit of a surprise to some, seeing how in November of 2015 Turkey shot down one of Russia's warplanes, Putin describing it as a "stab in the back." However, a slightly underreported fact is that in late-June, a mere two and a half weeks before the attempted coup, Erdoğan issued an apology to Russia/Putin for downing its aircraft and professed that Russia is Turkey's "friend and strategic partner." A couple of days later the ban on flights to Turkey via Russian airline Aeroflot was lifted, and the two leaders set aside August the 9th for a meeting in which they could discuss "normalization." Two and a half weeks after that, an attempt was made to overthrow the government in Turkey. Putin is likely to show up at his meeting with Erdoğan with a goody basket, such as promises of boosting tourism, trade, construction and pipeline deals. Pipeline deals? Now we're talking. But I've gotten way ahead of myself, so let me back up a bit. A few weeks ago, a couple of days after the attempted coup in Turkey went down, it just so happened that I was part of a group of people introducing themselves to one another, one of those being someone that had apparently just arrived from Turkey two weeks earlier. He didn't look all that interesting, which I figured meant that he might actually be interesting, so while I didn't waste any time bringing up the attempted coup, my Turkish "confidant" (as he'll have to be anonymously referred to) didn't waste any of his time in proclaiming that "it was a fake coup!" We'd both noticed that the majority of the mainstream media was going along with the story of the coup being real, except for an article I'd noticed in The Guardian. According to the article, a Turkish Muslim cleric living in self-imposed exile on a compound in Pennsylvania was stating that the coup may very well have been staged by Turkey's president in order that he may further consolidate his power. But while my confidant (who is of the of the Kemalist, secular persuasion) agreed with this theory, not only did he explain to me that Turkey's president and leader of the Justice and Development Party (AKP) is – or was? – a "puppet of Obama's," but he also stated to me that Fethullah Gülen, the Muslim cleric in self-imposed exile, is also a puppet of the United States. And not only that, but along with there being more than 2,000 Gülenist schools in 160 countries (which includes the largest charter-school network in the United States), my confidant stated that Gülen is by no means a moderate Muslim as I'd read him portrayed over and over again in the media, mainstream or not. Hmmm. On Turkey's political spectrum, the Gulenists were clearly political Islamists. It was their secrecy that made them stand out: Whereas most of Turkey's Islamists openly resisted secularism through grassroots organization and participation in the democratic system, the Gulen movement sought to subvert secularism. Move "within the arteries of the system, without anyone noticing your existence," Gulen advised his followers during a now-infamous sermon. In regards to Erdoğan, it seems to be well accepted that Turkey's president is a strongman bent on solidifying his power (and who got 52% of the votes in the most recent election). In just the past few weeks 150 generals and admirals (more than a third of the military) were detained, nearly 3,000 judges were relieved and another nearly 3,000 officers and soldiers were also detained, more than 1,500 university deans were ordered to resign and 21,000 employees at the education ministry also relieved, licenses were revoked from 24 radio and television stations and 20 online news portals were blocked, 50,000 passports have been cancelled, and all academics have been banned from travelling abroad until further notice. This is all part of a three-month state of emergency that Erdoğan declared, which essentially allows him to crack down on political opponents – or more specifically Gülenists, but I'll get to that in part 2. Alongside that, while it was declared by Erdoğan just before the coup that he intends to grant citizenship to 2.7 million Syrians, my confidant informs me that many secularists believe that these Syrians of strong Muslim persuasion will likely be sent to the western, more secular, parts of the country where they will drown out those already there and provide a base of religious loyalty for Erdoğan. But regardless of all that, I was nonetheless unable to bring myself to side with either of the two arguments du jour: that Erdoğan orchestrated the coup to provide an excuse for his further consolidation of power, or that he was taking advantage of a failed coup to achieve the same means. However, it did seem that it ultimately didn't matter either way, but I'll digress a bit in order to get to that. 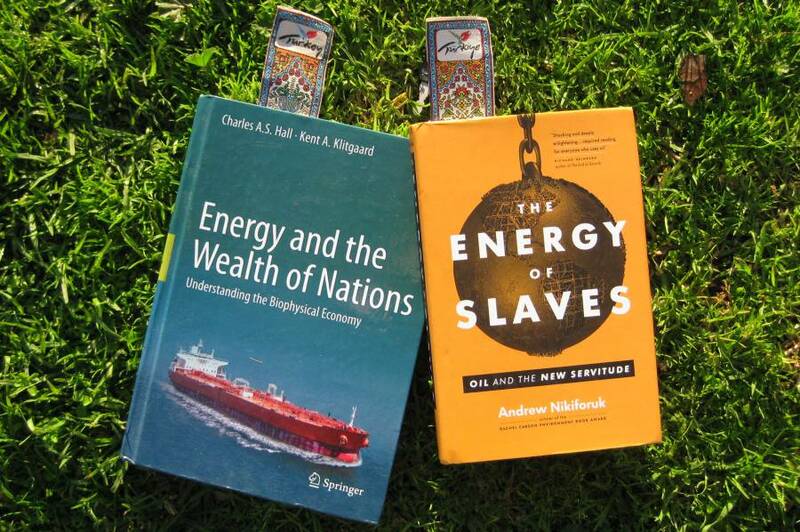 Although Turkey doesn't actually have very much of the world's remaining – and dwindling – fossil fuel reserves, it is a significant conduit for much oil and natural gas that make their way to the lucrative European market. Specifically, there is Turkey's Bosphorus strait where approximately 3% of the world's crude oil shipments pass through (which make up about a quarter of Europe's total crude imports), a couple of pipelines that transport Iraqi and Caspian crude oil, and the Ceyhan port on the Mediterranean which is Turkey's main export terminal for crude oil, coming in from Iraq and Azerbaijan. In effect, Turkey has a significant geopolitical position when it comes to fossil fuels from both the Middle East and Central Asia, and will be increasingly so as new gas projects come online. And since I tend to think that getting to the heart of many of these matters generally involves following the energy rather than following the money, this, I think, is where the underlying motives and reasons for the recent attempted coup – real or not – can be found. In short, Turkey is the central conduit-point for the proposed Turkish Stream pipeline which would carry natural gas from Russia to Europe (and which replaced the cancelled Bulgarian South Stream pipeline which would have also crossed under the Black Sea), and it is also a conduit for the proposed Southern Gas Corridor pipeline that would carry natural gas from Qatar to Europe as well. The former would contribute to Russia's/Gazprom's position as the largest supplier of natural gas to Europe, while the latter would meet Europe's desperate desire to diversify its source(s) of natural gas. At the same time, the Southern Gas Corridor would also benefit the United States by way of its Middle Eastern assets. These assets, it should go without saying, do their part in maintaining the status of the petrodollar – that is, their oil gets priced, bought and sold in US dollars. This is of the utmost importance to the United States since it allows for the US dollar to maintain its world reserve currency status, meaning that countries that want to purchase oil must procure US dollars. And while this often involves said countries selling their goods to the United States, being the bearer of the world's reserve currency means that, to a certain extent, the United States can print money at will, enjoy a bit of a free ride, and project an outsized degree of control over the world. Regardless, that's all to do with oil sold above the books. For as Nafeez Ahmed of Insurgence Intelligence has been investigating, it might very well be that Turkey has also been the central player in enabling supplies of oil from ISIS to be smuggled onto the market. According to a source that Ahmed quotes in an article he wrote last year, "Turkey is playing a double-game with its Syria strategy." ISIS and other Islamist groups have been sponsored by Turkey and "facilitated with the blessings of Erdogon," the underlying purpose of Erdoğan's being to use said groups to expand Turkey's foothold in the region. As stated, Turkey's goal has not been to shut down ISIS, but rather to attack it selectively in order to leave it with the chance to take down the Bashar al-Assad government in Syria. Furthermore, not only has witness testimony in Turkish courts claimed that Turkish military intelligence directly contributed to the rise of ISIS by shuttling arms into Syrian areas controlled by Islamist rebels, but in 2014 an MP of the Turkish opposition stated that $800 million worth of ISIS oil had been smuggled from Syria into Turkey. Alongside all that, foreign fighters from all over the world are said to be assisted by more than a thousand Turkish nationals to join up with ISIS in Syria and Iraq via Turkey. Turkish military intelligence has abetted all of this said the Turkish MP. Yet Turkey is a leading member of the NATO alliance. And while the Western members of NATO have gathered mounting intelligence confirming Turkey’s sponsorship of ISIS, they have refused to act on this intelligence. According to what is claimed to be an ISIS terrorist captured by Kurdish fighters (and whom the reporting of by two Kurdish news agencies purportedly resulted in them being blocked in Turkey), "There is an agreement between Turkey and ISIS. Turkey supports ISIS because it poses a threat to Kurds and they can use it against them." In short, the purpose of Turkey supporting ISIS has been to use it as a rampart to hold back Kurdish groups that have been gaining politically and militarily in the area. Likewise, and with Turkey often making headlines for being the initial destination point for foreign wannabe ISIS recruits looking to gain access to Syria, Ahmed cites a former counter-terrorism and crime prevention chief for the Turkish National Police as stating that the Erdoğan government turns yet another blind eye to tens of thousands of ISIS sympathisers coming in via Istanbul's airport, who then make their way through the lax Turkish-Syrian border so that after their training they may ultimately gain entrance to (ahem) paradise. In other words, NATO's second most powerful member has supposedly been aiding and abetting the growth of the ISIS terror threat, right under its nose. The eagerness of American and British oil companies to exploit Iraqi Kurdish resources, however, raises urgent questions as to whether US-UK government support for the KRG[Kurdistan Regional Government]-Turkish oil nexus is undermining the war on ISIS, if not fuelling the terror group. Neither the British nor American governments appear to be willing to answer these questions. There have been reports that Erdogan's regime supports ISIS... And while much of this news can be considered Russian propaganda, no one is sure exactly how much. In reality, both Russia and Iran are, like the US, neo-imperial state structures engaging in geopolitical expansionism. This country has never seen this kind of president or prime minister... No other president or prime minister achieved what he has done – in economic terms, in charitable terms, and in patriotic terms. There’s such a difference, a world of difference, in our lifestyle. Healthcare has especially improved. We have opportunities, and we have options. This is all true as my confidant has told me. Erdoğan has had many new roads built, hospitals constructed, etc. However, and as I was also told, this is not being done with Turkish money, but with money – loans – given to Turkey by the United States and Europe, a significant amount of which is used to purchase fossil fuels from foreign suppliers. As Steve Ludlum of Economic Undertow recently put it, "without loans the [Turkish] economy collapses in a hurry, with loans the collapse takes a little longer." Reason for the stated collapse being, Turkey (like every other nation) needs its steady supply of fossil fuels for its (ultimately futile) attempt to maintain its grasp on industrial civilization, never mind it needing increasing fossil fuels to power enough economic growth so that it can at least pay off the interest on those loans. 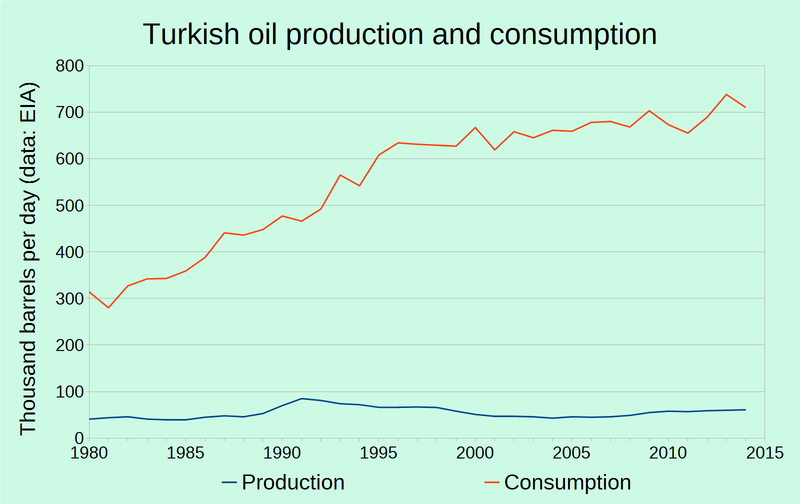 And since we've now reached the cusp of peak oil (Turkish translation here), and since EROEI levels (Turkish translation coming soon – see the Turkish translation page for updates) are rapidly diminishing, that all implies the protracted collapse of industrial civilization, be it in Turkey, Canada, Japan, or wherever. That is, of course, a whole other story (as I've previously written). Nonetheless, and as I've noted in two earlier articles, Turkey's neighbour to the west is in the first stages of becoming the initial first-world casualty in the collapse of industrial civilization. And while it's certainly arguable how much longer Turkey has left before it starts its journey to the endarkenment, could having a neighbour to the north with a still-ample supply of the juice – fossil fuels – needed to keep industrial civilization chugging along be enough to incite a strongman president to pivot from the bad guys to the bad guys? Who knows? Only time will tell. And maybe part 2 part 3. EDIT 29/08/2016: Upon completion of the last part of this Turkish trilogy a few changes were made to better clarify things and improve its overall structure. In part 1 the only major changes besides cosmetic ones were the deletion of a quote of Ahmed's and its preceeding paragraph about the KNC (both of which had little relevance to the post), as well as the moving of a single paragraph to part 3. A line was also added about who the purges were against, another added line mentioned the cancelled Bulgarian South Stream pipeline, and the lead image for part 3 was switched back to its originally intended position of lead image for part 1. EDIT 01/10/2016: I added a quote of Nafeez Ahmed's on Russia being, like the US, a "neo-imperial state... engaging in geopolitical expansionism" to dispel any confusion I may have made in giving the idea that Ahmed is a Russian mouthpiece. Move Over Perpetual Motion Machines, There's Now a Perpetual Data Machine – Big Data!